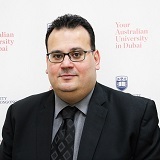 Prior to joining UOWD, Dr Osama taught at the Gulf University for Science and Technology (GUST) in Kuwait. He also acted as Director of Business Development and Corporate Relations at the University from 2007-2015. Previous roles at GUST included Chair of the Accounting Department (2006-2008) and Assistant Dean (2008-2009). Dr Osama has a broad range of experience in the undergraduate and postgraduate teaching of managerial and cost accounting, reporting analysis, auditing, accounting for decision makers and quantitative methods for decision making. “The Effect of Audit Quality and Audit Committees on Goodwill Impairment Losses”. International Journal of Accounting and Financial Reporting, Vol. 5, No. 1, 2015. “The Implied Cost of Equity Capital in the Jordanian Industrial and Service Companies”. International Journal of Accounting and Finance (IJAF), Vol. 4, No. 3, 2014. Pp. 240-260. Dr Osama has extensive consultancy experience, having served as a talent and training consultant for the National Bank of Kuwait’s corporate academy since 2009. He has also established a reputation as a renowned financial consultant for a number of other prestigious Kuwaiti banking, investment and service corporations. Dr Osama is a member of the British Accounting Association and the American Accounting Association.